Not every dog owner is a fan, but the use of a crate can make the life of you and your dog a lot more pleasant if used properly. There are a number of things to think about when you are going to use a puppy crate. A crate should be seen as a safe place and resting place for your dog. If your dog lies down in the crate by itself, this is a sign that your dog is looking for a sleeping place. Children and other people should leave your dog alone at this moment. Never use a crate as a punishment! Take the time to let your dog get used to the crate so that he will see the crate as the goal for which it is intended: rest and safety. A crate can help to potty train your puppy. Always use the size crate that is suitable for your puppy's breed. Your pup should still be able to lie, stand and turn around in the crate at the moment that he is an adult. The crate should not be too big. Especially for puppies of large dog breeds the crate is often too big at the beginning. There are several types of puppy crates you can use, for example the Bean Crate 2 door or the Pawise Wire Dog Crate. Click here for an overview of our complete range dog crates. If necessary, reduce the space in the dog crate so that your pup can still lie comfortably. This can be done by dividing the crate in two with an extra (wooden) wall, or by initially putting a large box in the crate from which you remove 1 side at the side of the door. Reduce the crate with something where your pup cannot climb on, otherwise the danger exists that he can fall off or get stuck against the wall of the crate. Only if the crate is small enough you can prevent your pup from pooping and urinating in the crate and you can also use the crate for potty training. As it happens, a dog does not naturally want to pee or poop at its sleeping place. If the space is too large, then you don't achieve this goal. This also means that you must pay good attention to the signals of your pup and get him out in time if he needs to poop or pee. If you do not do this, then you teach your pup that he is allowed to pee and poop in its crate. It is important to find a good place for the crate. Put the crate in a quiet place in the living room where your pup has a view of the whole area. Do not put the crate in a walkway or in front of the TV. Do not put it in front of a (open) window or heater to prevent draughts and temperature fluctuations. Make the crate comfortable with a soft cloth or cushion, for example with the Scruffs Expedition Mat. In any case, it is important that your puppy cannot slip. Let your pup discover the crate by regularly putting something nice in the crate. The first impression should always be positive! If food is not interesting enough to explore the crate, you can also put a favourite toy inside. The door should always be open at this stage. If necessary, temporarily fasten it to prevent the door from closing when your pup is in it. Do not force your pup into the crate! If your puppy enters the crate easily by himself the real training can start. Feed your pup inside the crate. Put the bowl in the back of the crate as much as possible, so he has to go all the way into the crate to eat. If he is afraid, then move the bowl at the door and move it a little further backwards with every food serving. If this goes well, you can try to close the door occasionally while eating. However, open the door again immediately if your pup has finished eating. Try to close the door somewhat longer, up to about 5 minutes. Try to prevent your pup from crying before you open the door. Not sure what to feed your growing puppy? Then have a look at our wide range of Royal Canin puppy food. Does eating inside the crate go well and are you able to close the crate door 5 minutes after eating, then you can try to teach your pup a command. This command should indicate when your pup should be ready to go to its crate, for example 'crate' or 'place'. Again, do not use this command to punish your pup! The crate must remain pleasant. Reward your pup if he quietly goes into the crate and closes the door for a moment. Open the door after a few moments and reward your pup if he remains quiet. Use for example our training treats for dogs. Keep practising until your pup understands the command. Try to close the door a little longer, but stay in the same space. If your pup remains calm when he is in the crate and you close the door for a longer period of time, you can leave the room for a short time. You can always make this time somewhat longer. If you succeed to leave your pup alone for 30 minutes then you can try to leave the house for a short period of time. Practice this and vary with the time that you stay away. Do not make the farewell a unnecessary long or emotional happening. Reward your pup if he quietly enters its crate and leave the house. If you come back home then reward your dog with a nice treat once the door has been opened. If this all goes well, you will have a dog that has a positive association with its own crate. The crate can then be a handy tool to use if your dog has to stay home alone. 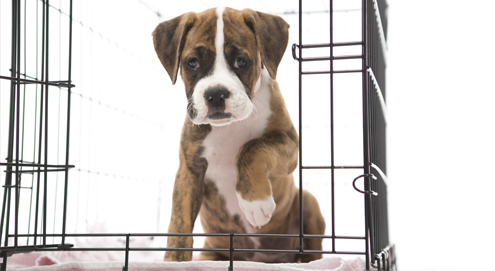 Your pup keeps whining or crying inside the crate, now what? It can be very frustrating if your puppy keeps crying or whining once he has to enter its crate. It may be that your dog currently has another need, for example because he has to pee or eat. However, it is also possible that you started with crate training to quickly and need to take a few steps back. A very important thing to remember is to never hit the crate to get your pup or adult dog quiet. Your dog will then be scared from the noise and movements and will associate it with fear. It could even be so that your dog associates its owner with fear! Your puppy often cries because of a valid reason. He needs to pee or do its business, feels hungry or is bored. Try to find out why your dog is crying and act accordingly. Take of your dog's collar before placing him inside the puppy crate. This is because dog collars can get stuck with certain movements of the neck, causing your pup to get traumatic experiences or even suffocate. Good luck training your puppy or dog! Mobile home for your dog. Protective cover for Buster Memory Foam Bed. Soft cuddly toy with heat source. Comfortable crate pillow in sand colour.